Scalebuzz Review 2019: Is Scalebuzz a Good Hosting? Scalebuzz is an Indian web hosting provider that uses Tier IV data centers. 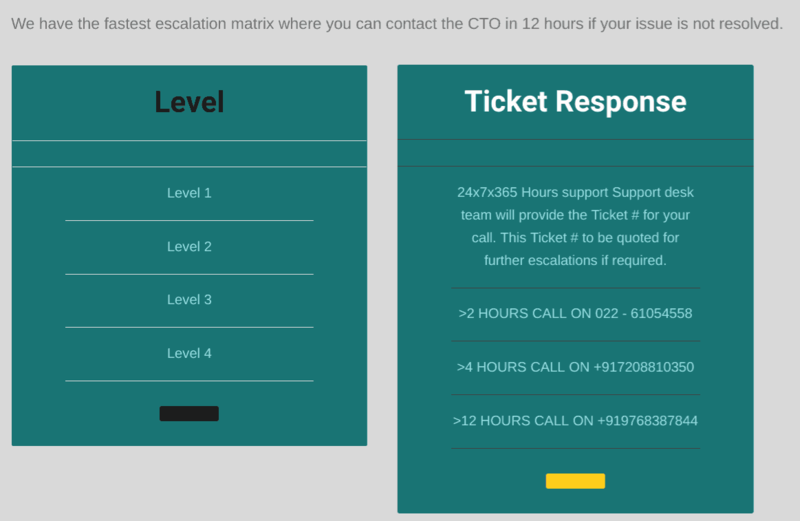 They have an uptime service level agreement, and they provide 24/7 customer support. Scalebuzz is an Indian web hosting provider that uses Tier IV data centers. They have an uptime service level agreement, and they provide 24/7 customer support in English. Their website is also in English. It’s nice to see that Scalebuzz uses a fully redundant network connected to multiple Tier III (less than 1.6 hours downtime per year) and Tier IV (less than 26 minutes downtime per year) network providers. This allows the vendor to offer a 99.9% uptime guarantee backed by a decent service level agreement along with guaranteed network speeds. This company’s shared hosting plans are pretty simple (hence easy to understand) but have good resource levels. The three plans – called Basic, Bronze, and Silver – come with 1GB to 6GB disk space and 30GB to 120GB bandwidth. All plans include a free website migration, cPanel access, a DDoS protection plan, and R1 Soft backups (at additional cost). The single domain is a little limiting, but you do get unlimited subdomains, unlimited email accounts, and unlimited MySQL databases with phpMyAdmin access. As well as having pretty impressive resource levels, the plans include an application installer, website building tools and support for PHP; however, they lack support for advanced coding languages such as Python (for experts). What is nice is that when you’re ready to scale up from shared hosting, they also offer dedicated servers and virtual private server rentals. Prices are quite low compared with both local and international companies, especially when considering the high level of resources and beginner- and expert-friendly features. Domain registration and SSL certificates both cost extra. Plans can be bought on one, three, six and twelve-month terms. As well as offering a no-obligation monthly plan that limits your risk, they also offer a discount for purchasing a longer plan up-front. Although it’s not explicitly advertised, you will also find a 30-day money-back guarantee hidden away in their terms and conditions. 24/7 customer support can be accessed via email, via U.S. and Indian telephone numbers, and via live chat. Their knowledge base is empty, and none of their social media channels appear to be particularly active. However, every time I have contacted them via live chat, they have picked up immediately and have been very helpful. If you are looking for lots of additional features, this hosting provider likely won’t be the best fit for you. But if you want a rock-solid uptime guarantee, use of Tier IV data centers, stellar customer service, and comprehensive resource levels, you won’t be disappointed. 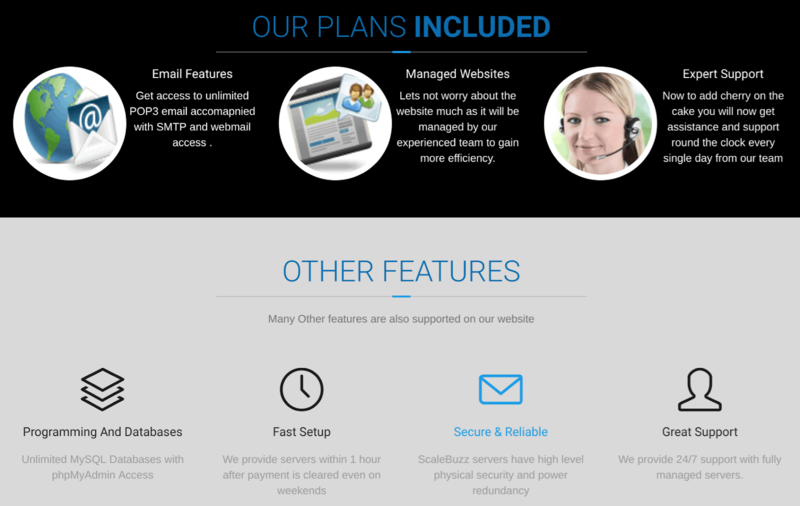 Wondering how Scalebuzz stacks up against other Web Hosting companies? Enter any other Web Hosting company and we will give you a side-by-side comparison.